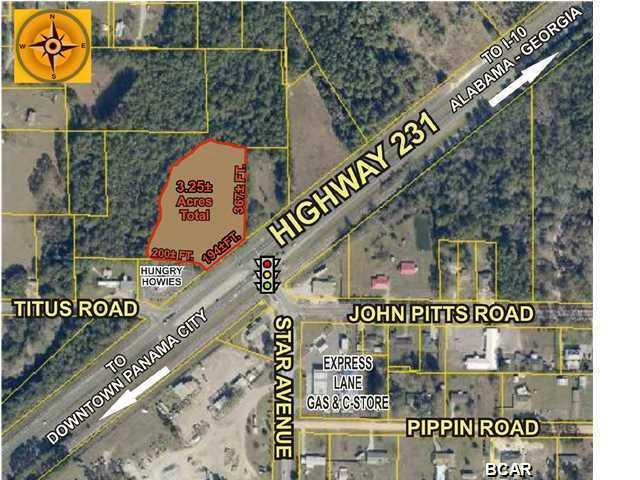 3.25 ACRE SUPER SITE AT HIGHWAY 231 AND STAR AVENUE WITH 194 FEET ON HIGHWAY 231. THE SITE HAS BEEN CLEARED AND FILLED, READY FOR DEVELOPMENT! A median cut and traffic light provide direct access to this HIGH TRAFFIC-HIGH VISIBILITY SITE from Highway 231 and Star Avenue. The traffic count on Highway 231 is 21,500 (FDOT - 2013) and 6,600 on Star Avenue (FDOT - 2013). Also providing traffic to the site is John Pitts Road 5,100 (FDOT - 2013). Water and Sewer Available (Bay County). Commercial C-3 Zoning (Bay County). HIGHWAY 231 IS THE PRIMARY NORTH-SOUTH ARTERY TO ALL RESIDENTIAL AREAS IN THE MARKET, AS WELL AS, TO I-10, ALABAMA, GEORGIA AND DOWNTOWN PANAMA CITY. STAR AVENUE ALSO PROVIDES THE PRIMARY ACCESS TO THE LARGEST RECREATIONAL COMPLEX IN THE CITY, H.G. HARDER'S PARK.